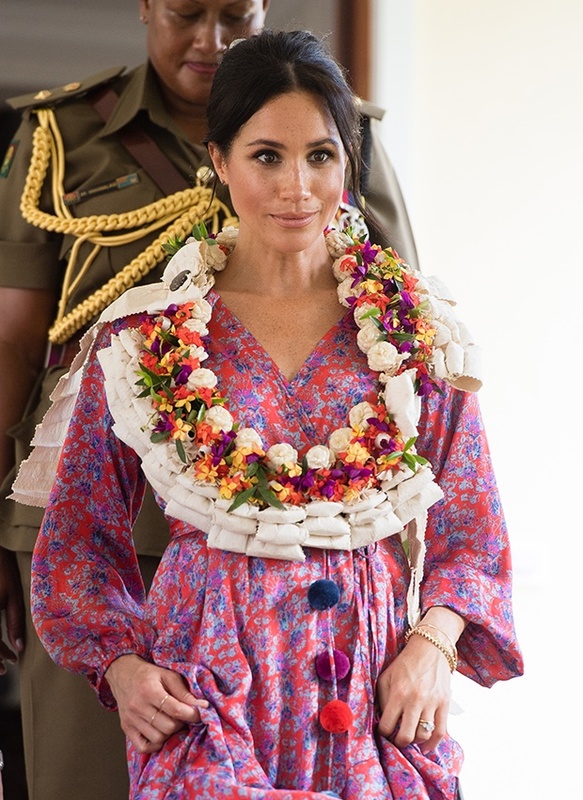 Suva, Fiji - The Duchess of Sussex was rushed through her visit to an indoor market in Fiji's capital Wednesday due to concerns about the large crowd that came to greet her in the relatively confined space. Meghan had visited Suva Market to meet some of the female vendors who have been involved in the U.N. Women's project "Markets for Change." Vendors were selling watermelons, pineapples and other fruit at the market, as well as handicrafts and fans. "This visit is particularly nostalgic for us as a young married couple," Harry said. "My grandparents stayed in this very hotel, the Grand Pacific, a number of times over the years. But this visit is also an opportunity to learn more about the future of Fiji, your economic growth, sustainable tourism development and social enterprises." The couple is scheduled to visit Tonga on Thursday before returning to Sydney on Friday night for the final days of the Invictus Games, Harry's brainchild and the focus of their tour. The couple will then finish their trip with a four-day visit to New Zealand.